Ideas don’t just fall from the sky, even though we definitely wish that they would. And since those ideas aren’t just landing right in the laps of our staffs, there are plenty of places to look to get inspired. 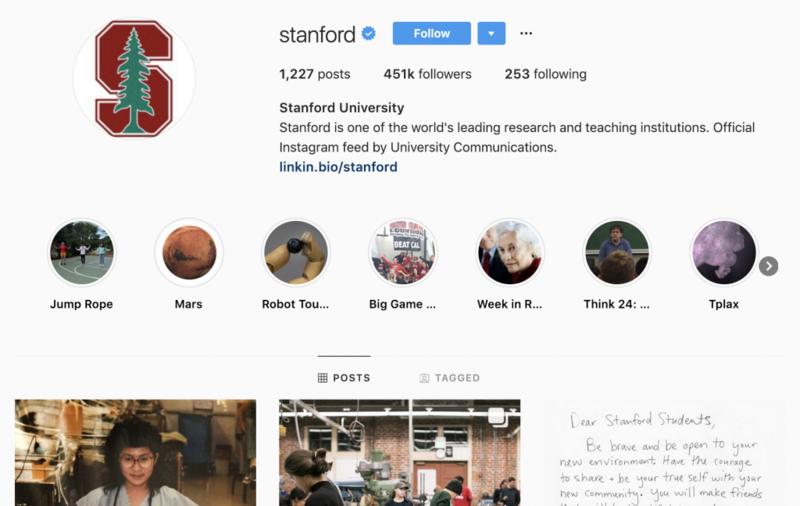 College instagram accounts are one of those places and here are five (well, kind of six) you need give a follow with three of the key reasons why they deliver some of the best ideas you can mimic with your staff right now. User-generated content and submissions (don’t forget to credit those people with a tag in the caption) not only provide a different perspective of your campus, but also give others a chance to contribute to the success of your media program. Athletic accounts are some of the most innovative accounts out there. 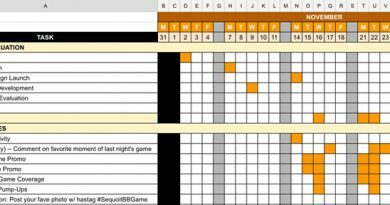 This one showcases a number of cool templates to celebrate athletes’ weekly wins, highlights from big (or small) games, as well as quick snapshots of fans, athletes and the venue using videos and photos. On top of that, they find a number of different ways to show off studio photography skills in their promos for their schedule–both full season and upcoming games. Their highlights combine photos and video, both of which are inspired by something going on in the world and grounded by someone in their university who is known for something related to that topic. This is a great way to showcase your teacher and student experts in your schools, while also telling stories multimodally. Love letters may be a thing of the past as a result of technology shifts, but Stanford brought it back to life by posting letters of advice from alumni. This could be a great exercise for seniors as they leave to provide letters to the freshmen, or a cool chance for alumni to share their love back to the school during a homecoming spirit week. Humans of New York inspired a total new style of storytelling, and Stanford chose to capitalize on that approach with environmental portraits and short narratives of their graduating student body. While many of us have tried HONY, this may be an opportunity to find a new niche or a different way to focus that storytelling approach. 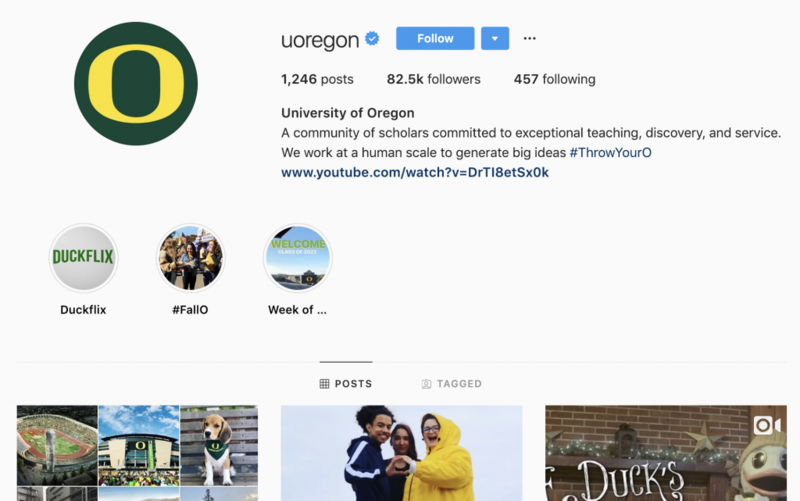 University of Oregon is tucked away nicely in the Pacific Northwest, but their Instagram account is completely in your face, but in a good way. Capitalizing on the beauty of the region, the home of the Ducks provides a unique and beautiful opportunity to show off the campus environment and tell unique stories at the same time. Oregon, unlike the other universities on this list, uses a lot of group shots, particular getting their students to “throw [their] O” all around their campus and the world. If your school has a unique hand sign or flag that can travel around campus or on school trips, maybe you too can get your Instagram to be full of students and staff throwing their O. The Duck is a face known all around the mascot world, and Oregon makes him a staple to their Instagram stories. Sometimes the Duck is getting into some trouble, other times he’s celebrating a group, but, no matter what he does, the Duck is priority. He even appeared in an Instagram series called DuckFlix that is now moved to YouTube and linked through Instagram. Use your mascot to your advantage and find ways to tell promotional stories about your school, your sports and your activities. Oregon does it flawlessly, so borrow some ideas from them to get your brain working. One of the coolest (and seamless) photos sets I’ve seen on any account comes from Oregon. The opening photo of a post is an environmental portrait or headshot of a student. After swiping to the next photo, editing was done to make it seem like the photo continues to wrap to tell a seamless story. Each includes three photos in the series: the portrait/headshot, the wraparound with the student’s name/major, and, lastly, a quote from the student. The caption also provides more context to the story. 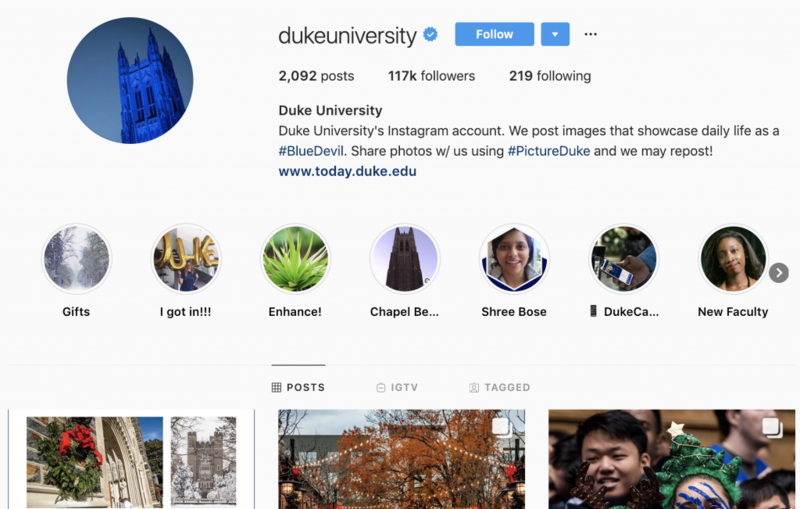 Duke’s basketball team and academic prowess shouldn’t be the only things they’re known for; their Instagram account is full of incredible stories and awesome ideas that any media program can take and use. A number of the photos on this Instagram account are close ups, which is very uncommon compared to most other accounts out there–including our media programs’ accounts. Each of these photos are submitted by students and staff, but offer a unique look at the university as a whole. What Duke knows how to do is show their personality, and they do that using fun and flowery language and emojis. Many media programs are worried that doing this would breakdown the fourth wall, when, in fact, this is exactly what your audience is begging for; let your instagram be wholly you. 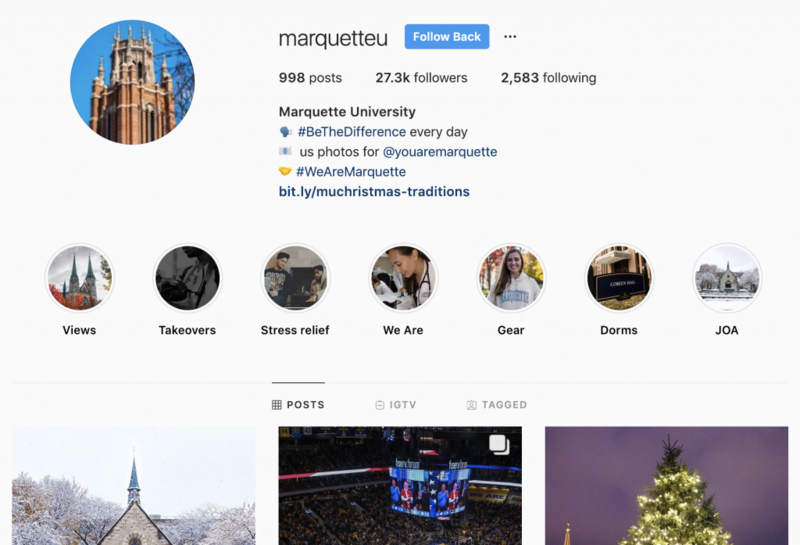 Hashtag consistency is so important and Duke uses a few that are consistent across their exceptional social media presence. On of my favorites is #DukeIsEverywhere, which showcases all the places their students and alumni are. This could be a really awesome chance to get alumni engaged with your school and student media, so why not start your own #SchoolIsEverywhere hashtag and get your alumni on board to make it trend. Their bio says it all: “the city is our classroom.” New York University not only boasts what they see as the nation’s biggest classroom, but they also have rich and diverse experiences around the world that they’re ready and willing to show off to their followers. The university in the Big Apple has a whole lot you can take a bite out of for your own Instagram. It may have been a trend that could be considered a throwback in itself, but NYU didn’t let #TBT be #useless. Instead, they used archived photos combined with thoughtful captions to create timeless posts. If your school is older (mine is over 100 years! ), then this could be a great introduction to social media assignment for an intro class or new reporters. And, what a beautiful and way to be consistent on your account and showcase history at its finest. Yearbooks, this would be great for you! 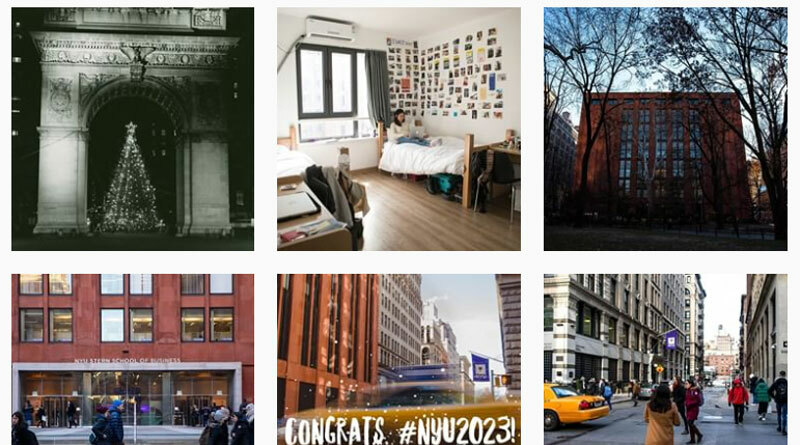 NYU has a really strong alumni base and their students are incredibly engaged, and that shows on their Instagram page. What NYU has that a lot of student media don’t are ways to engage your readership. 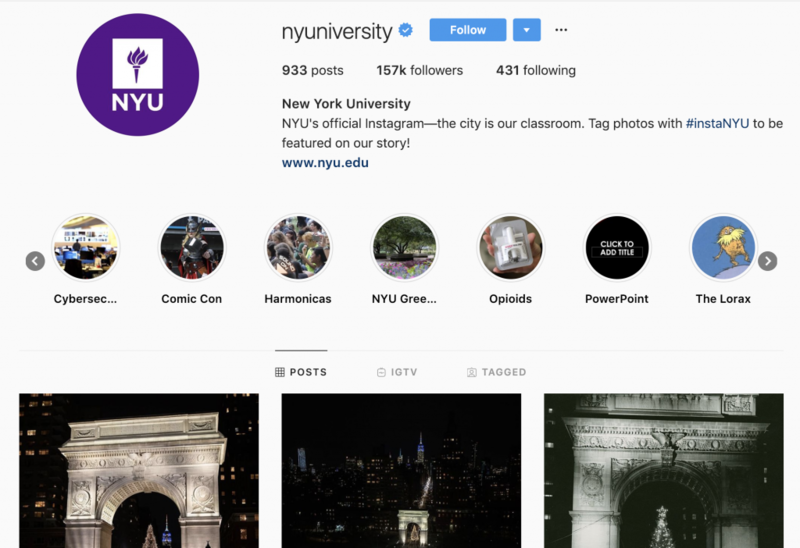 The NYU account asks thoughtful questions sparked by beautiful images, and the comments that follow shows that their readership cares and wants to connect. These are sometimes even Q&A sessions that are coupled with live videos that are then archived. While it isn’t visible to the naked eye, NYU has social media ambassadors–members of their community that help expand their coverage beyond their designated social media team. These people aren’t hired staff, but instead others who want to commit their time. Let’s be real: these people are probably the real influencers of the school and they know a thing or two about quality pics, editing, and what makes a great caption. We know these people and they aren’t always on our staffs, so why not have your own ambassadors? Develop a policy, set some guidelines, recruit, and see what can happen. Maybe your classroom becomes as large as NYU’s in the process.